No filtering - Displays every event logged since Comodo Internet Security was installed. If you have cleared the log history since installation, this option shows all logs created since that clearance. Within last -	Shows logs from a certain point in the past until the present time. Except last - Excludes logs from a certain point in the past until the present time. Current Week - Displays all logged events during the current week. The current week is calculated from the Sunday to Saturday that holds the current date. Current Month - Displays all logged events during the month. Within the Period of - Enables you to select a custom period by specifying 'From' and 'To' dates. Alternatively, you can right click inside the log viewer module and choose the time period. Completed - Displays only tasks completed on the specified date. Parameter	- Displays only tasks that include the selected parameter. A 'parameter' is a sub-type of the main task type. For example, 'Quick Scan' and 'Rating Scan' are both parameters of the main task type 'Antivirus Scan'. Type	- Displays only tasks of a certain type. 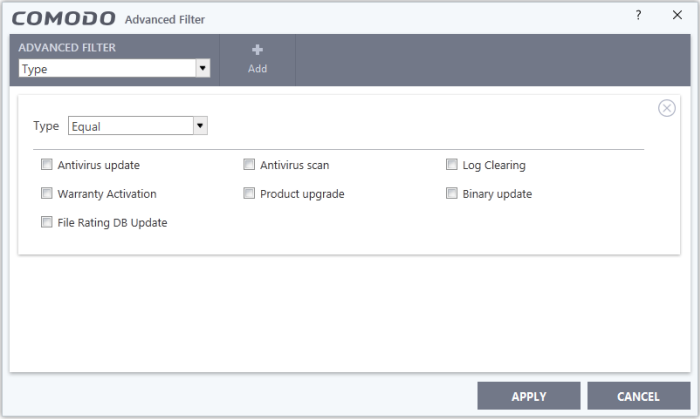 Tasks that you can filter for include antivirus updates, antivirus scans, log clearing, warranty activation and more. 1. 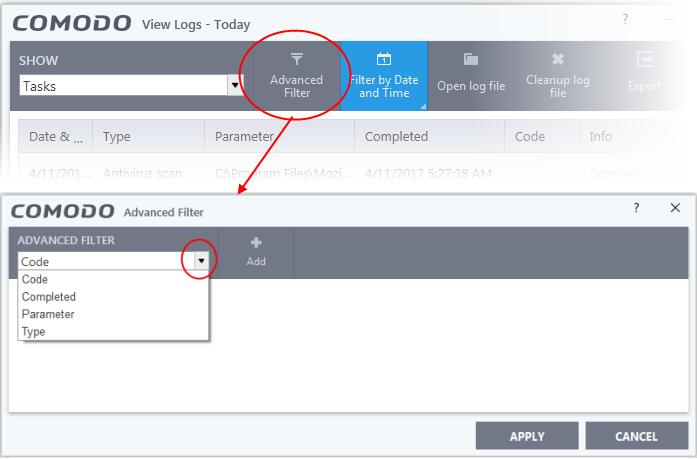 Click the 'Advanced Filter' button from the title bar (or right click inside the log viewer module and choose 'Show Advanced Filter' from the context sensitive menu). The 'Advanced Filter' interface for 'Tasks' logs will be displayed. 2. 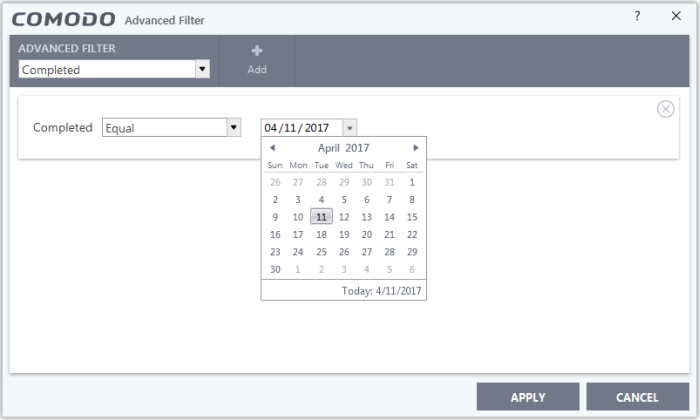 Select the filter from the 'Advanced Filter' drop-down and click 'Add' to apply the filter. Code: Filter incomplete tasks according to their error code generated by Windows. You can view task codes in the 'Code' column of the log viewer. Selecting the 'Code' option will display drop-down and text entry fields. For example, if you have select 'Equal' and entered '0x80004004' in the text field, then only entries containing the value '0x80004004' in the 'Code' column will be displayed. Completed: Lets you filter logs based on the completion dates of the Tasks. Selecting the 'Completed' option displays drop-down box and date entry field. a. Select any one of the following option the drop-down box. b. 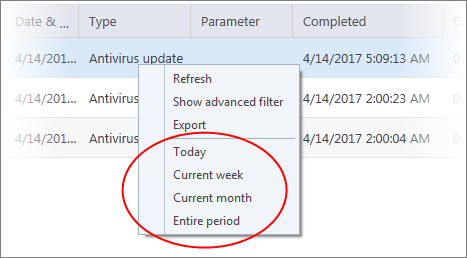 Select the required date from the date picker. For example, if you choose 'Equal' and select '04/11/2017', only the logs of tasks completed on '04/11/2017' will be displayed. Parameter: The 'Parameter' option lets you filter entries based on the 'Parameter' column of the log viewer. This includes descriptions such as 'Quick Scan' and 'Rating Scan'. Selecting the 'Parameter' option displays drop-down and text entry fields. For example, if you choose 'Contains' option from the drop-down and enter the phrase 'Quick Scan' in the text field, then only the entries of 'Antivirus Scan Tasks' with the scan parameter 'Quick Scan' will be displayed. Type: Allows you to filter entries based on type of 'Tasks' launched. Selecting the 'Type' option displays a drop down box and a set of specific task types that can be selected or deselected. Click 'Apply' for the filters to be applied to the 'Tasks' log viewer. Only those entries selected based on your set filter criteria will be displayed in the log viewer. 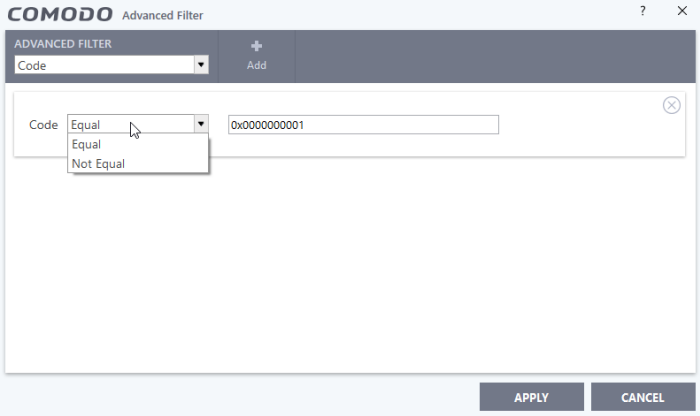 For clearing all the filters, open 'Advanced Filter' pane and remove all the filters one-by-one by clicking the 'X' button at the top right of each filter pane and click 'Apply'.